I can’t really be bothered with salads, and after years of trying to convince myself that I should eat them more often them I have concluded that yes, they can be nice, but only occasionally and in moderation. If you’re looking for a very simple salad to go with some meat or fish then this is your man. It’s very easy to prepare and has a lovely smoky flavour courtesy of the paprika. In a small bowl combine the garlic, cumin, paprika, wine vinegar, parsley and olive oil and whisk vigourously for a couple of minutes. Set aside. 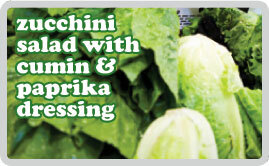 Mix the zucchini with the salad leaves and then pour over the dressing. Toss the salad to coat everything and serve.